When a moustache turns out to be the best thing about screenwriter David Koepp’s latest film as director (he hands over scripting duties for this one to Eric Aronson, whose only previous writing credit is for a movie starring former N’SYNC member Joey Fatone – that’s all you really need to know about it), you know you’re in serious trouble. Mortdecai is depressingly awful, for a number of very solid reasons. Koepp, who had previously collaborated with star Johnny Depp in 2004 thriller Secret Window, cannot latch himself onto the same wavelength of humour that derides from Kyril Bonfiglioli’s much funnier books, on which this film is based. It’s clear that he’s aiming for something that the likes of Peter Sellers and Blake Edwards would have made together back in the day, when the lust for Inspector Clouseau was fresh and exciting. The thing is, however, THOSE films were funny; Mortdecai so desperately digs for any undermining joke it can find to try and make us laugh, from a fart joke to an old person joke to a series of uninspired slapstick even Bugs Bunny would roll his eyes at, that after a while you just want to give it a hug and reassure it that everything’s going to be okay (a bit of false hope there, but just try and be nice while doing it). It’s not even Koepp’s finest hour as a director either, and this is alarming given his strong eye during his previous film, the Joseph Gordon-Levitt bicycle action-thriller Premium Rush. Scenes are so uncomfortably positioned next to each other that they lack coherence and continuity; for instance, in one scene Depp’s babbling aristocrat (more on him later) is shown completely drunk and argumentative without any build-up to it or even mention of his actions in the previous scene. It serves no purpose and could have easily been wiped from the film altogether if it weren’t for Koepp’s apparent insistance that it remains in for whatever unfathomable reason. Some really bad CGI can also be found in the film’s multiple use of geographical pinpointing, but worst of the lot comes from an explosion later in the film that is so incompetently done that you’d swear they’d hired a mid-school graphics designer to finish it. Koepp has proven to be perfectly decent behind the camera before, so why he does the proceedings here half-arsed and without a shread of passion is anyone’s guess. It is bizarre in how bad this movie is, especially when there are, to its credit, a lot of talented people working on it. However, most of the cast is left completely stranded and with no choice but to completely embarrass themselves in order to get by. Paul Bettany gets the most sympathy for all the physical abuse he suffers throughout the film, including multiple gun-shot wounds – most of them caused by Depp’s Mortdecai, adding insult to injury – and being attacked by various henchmen and a guard dog; no wonder Bettany looks like he’d rather be somewhere else. Thinking much the same thing is a charmless Ewan McGregor, as a posh Police Inspector with romantic ties to the Mortdecai’s trophy wife played by Gwyneth Paltrow (who, surprisingly, manages to barely escape with her dignity intact); poor Olivia Munn is reduced to pimping out her own body to leave an impression, and that IS indeed as sexist as that sounds; and Jeff Goldblum, appearing in only a handful of scenes before his unceremonious departure, may as well have not been in it at all. 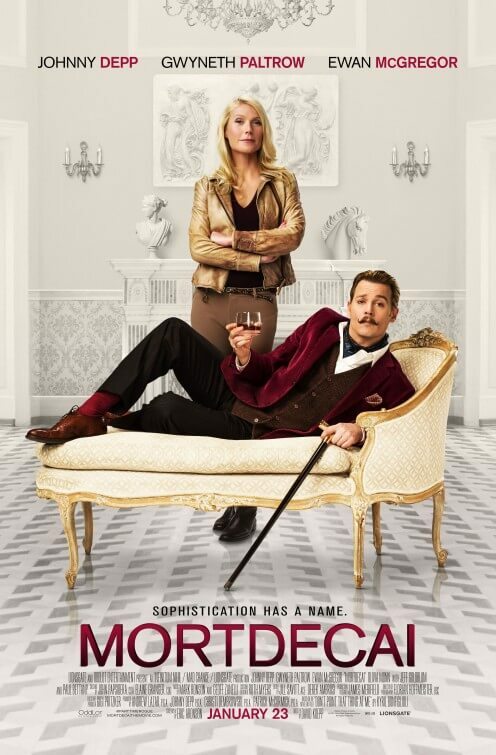 As for the main man himself, his Charlie Mortdecai is an amalgamation of every single Johnny Depp performance since – and including – Captain Jack Sparrow, and comes out desperate and insufferable because of it. We hesitate to even call it a performance, because it’s so over-the-top and without a hint of subtlety that it’s infinitely more caricature than actual acting, to a point of dangerously nearing self-parody. It doesn’t help that his character is irredeemably self-centred and unlikable, and you wonder how anyone could put up with him for more than five minutes let alone nearly two hours. However, the biggest offense that Mordecai causes is that it’s ungodly boring. We may have mentioned a moment ago that it’s just under two hours, but with its endless lack of jokes and uneven pacing it feels like a tad over three. There’s nothing going on that’s of any interest to the audience, with an increasingly complicated art theft plot involving Goya and a bank account that isn’t wrapped up as clean as it thinks it is, and everything is so cartoonish and over-the-top it’s amazing when we’re asked to take it all so seriously. The funny thing is, this is exactly the kind of caper involving stolen artwork and aristocratic protagonists that worked so well in The Grand Budapest Hotel – hell, Jeff Goldblum even appears in both! – but for so many reasons doesn’t even come close with Mortdecai. Perhaps if it adopted a more appropriate time setting, like the 1960s or earlier, but in a contemporary modern setting where aristocracy is all but extinct and women’s rights stronger than ever, Mortdecai falls completely flat on itself. And that’s something even a luxuriant moustache can’t fix.